Over the course of the next few months, WWE is set to host some of their flagship events, starting with WrestleMania in early April. Each year around this time, wrestling fans from all over the globe flock stateside to see their favorite performers take to the squared circle. If you’re looking to attend a WWE event this year, choosing the right seats can make or break your experience. 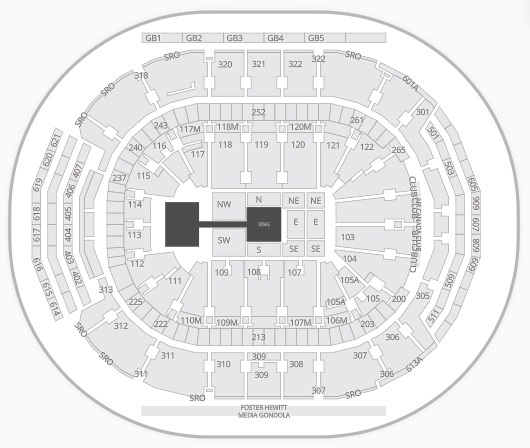 Fortunately, SeatGeek has put together a seating chart guide for five of the hottest events on the upcoming WWE schedule to help you find your perfect view of all the action. NXT, which is WWE’s developmental wrestling brand, has long been praised for its fantastic roster of up-and-coming stars as well as their propensity for putting on awesome shows. Their most high-profile show each year takes place on the weekend of WrestleMania, and NXT’s big event usually is praised as one of the best wrestling events of the year. Each year WWE’s flagship event, WrestleMania, takes place in early April and features top-tier matches and returns from big-named superstars of years past. WrestleMania is the culmination of the past year of WWE’s events, so the card will be packed with must-see matches from feuds that have been bubbling over for the past 12 months. One of the more unique pay-per-view events on the WWE calendar is Money in the Bank, which features ladder matches with a briefcase suspended in the air. The briefcase contains a contract for a championship match, which goes to whichever wrestler who can climb a ladder and nab the briefcase. Whatever wrestler wins the match can cash in their contract at any point in time in the next calendar year for an immediate world championship match. One of the most notable cash-ins was Dolph Ziggler back in 2013, who traded in his briefcase the night after WrestleMania, defeating Alberto Del Rio after the latter was injured in a match. The crowd went wild as Ziggler made his way to the ring, and he eventually pinned Del Rio to become the World Heavyweight Champion. After WrestleMania, the second-biggest WWE event of the year is SummerSlam, which takes places in mid-to-late August each year. The first ever SummerSlam event was held back in 1988, and the event is returning to Toronto this year for the first time since 2004. The summer event has provided wrestling fans with some of the more memorable moments of the past decade, including last year’s event when Roman Reigns faced off against Brock Lesnar in the main event. Reigns defeated Lesnar with his signature spear, ending Lesnar’s Universal Championship reign at 504 days. One of the longest-running events in WWE is coming to Illinois this November, when the WWE’s Survivor Series takes place at Allstate Arena in Rosemont. Survivor Series is the second-longest running event in WWE after WrestleMania. The pay-per-view spectacle features elimination-style tag-team matches, where teams of wrestlers face off against each other. Wrestlers are eliminated one-by-one as they are pinned until just one remains. The last wrestler standing wins the match for their team. Last year’s Survivor Series was a doozy that featured a 10-on-10 match and two 5-on-5 matches.